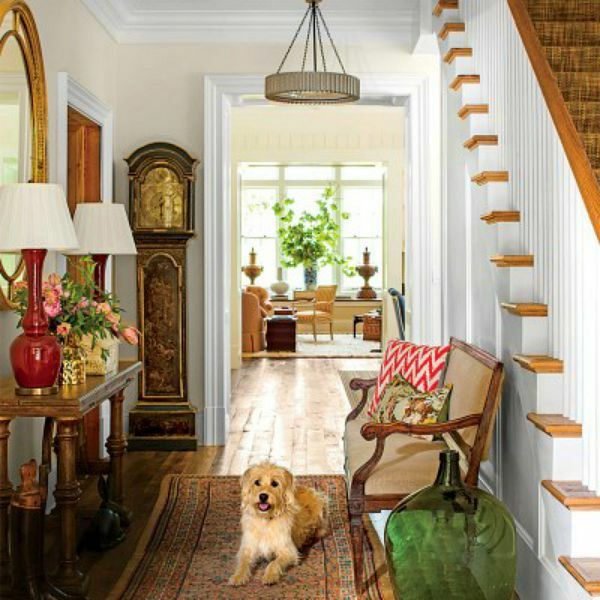 Designer Bunny Williams decorated the Southern Living Idea House near Charlottesville this year, described as “A modern interpretation of a classic Virginia farmhouse.” Sounds good to me! 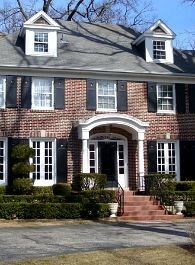 When I saw this stone and clapboard exterior, I couldn’t wait to get a look inside. 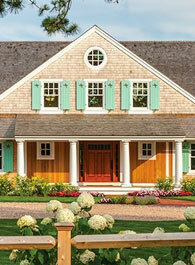 The showhouse was designed by Rosney Co. Architects in the 2,300-acre conservation community of Bundoran Farm. Bunny says her mother always had a red Oriental rug like the one she put in the entry hall here: “She’d say, ‘Look at the color of your soil, and get a rug with that background.’ ” Made me laugh. I guess I need to stock up on a lot of brown rugs, then! They used the extra-deep window seat as a decorative surface, but I’d want to sit in it! Bunny calls this “the elegant man-cave” with heart-pine paneling like you’d find in a lot of old farmhouses in Virginia. 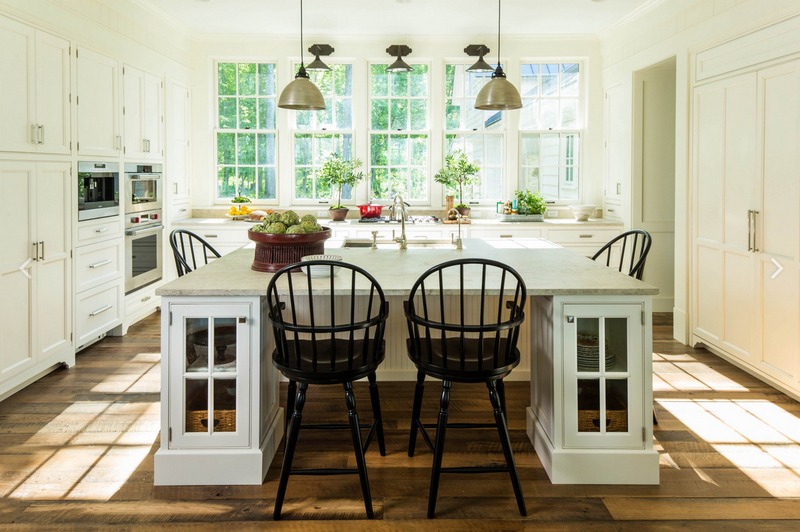 Bunny opted for a white kitchen with wood floors and limestone counters to “infuse the kitchen’s modern design with a casual farmhouse feeling,” according to the architect. The pantry has dramatic navy cabinets and a ceramic graphite backsplash. “We wanted to take full advantage of all the outdoor spaces in this house, and this open-air room really does that,” the architect says. 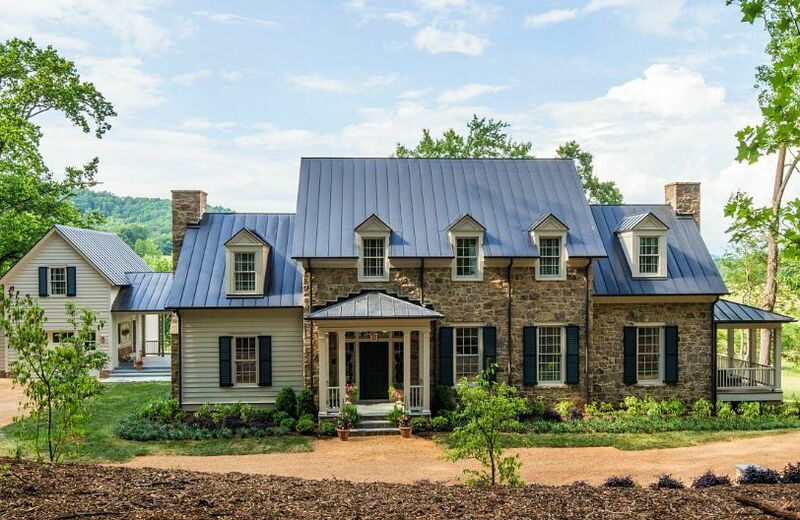 The 2015 Southern Living Idea House is near Charlottesville in North Garden, Virginia. It’s open for public tours until December 27th. If you have a chance to go, let us know what you thought about it. I wish I could make the drive over there to see it myself! Thanks for all of your kind words about the new site design this week. We’re still getting the kinks out, but it’s getting there. I’m insanely excited about some of the changes, like the fact that I can post bigger pics now. I’m also loving little details Cathi added like the “roof icons” in the comments. So fun. Got my issue in the mail yesterday, and drooled over this house! And here it is today! Love the kitchen, portico, dogtrot…well, just love the whole package! Found the title of “pajama room” humorous and perfect as I had never heard that space called that before. I have pinned some of your pictures to my dream space board. We may be building in the future, so I have been saving ideas. Love the new design of your site! The outside is beautiful. I will probably be in the minority here, but, the inside just isn’t what I expected based on the outside. 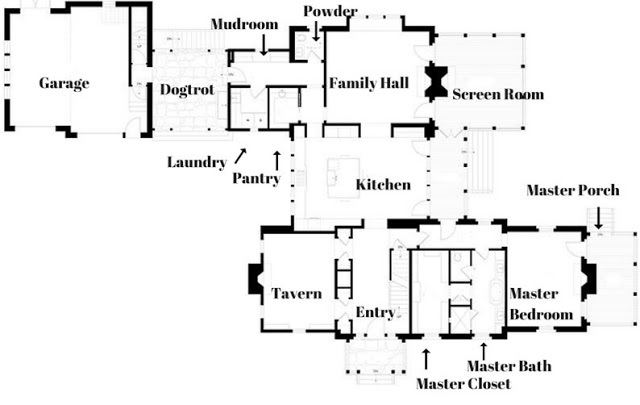 Looking at the floorplan, all the rooms seem so separated and boxed off from each other. I get that the kitchen is usually the center of family life, a place where people gather, so it’s in the center of the home, but personally I wouldn’t like my guests to have to go through the kitchen every time to get to the other side of the house. But the outside is beautiful. Good point about the kitchen location, Aaron. I hadn’t thought about that! In staring at the floor plan more, I see that if I am unloading a pile of groceries from the car in the garage, I’d have to lug them across the dogport, through the pantry, around the long hallway before getting to the kitchen. I’m not sure that would work for me. I’m not normally this easily confused, but is this a newly constructed home? Or a renovation or interior design show of an existing home? Since you mention an architect, “show house,” etc I’m guessing new construction. They really went to town with the ‘old house’ vibe if that’s the case — from the hardwood floors that genuinely look “worn in,” to the wood paneling, and the gorgeous exterior! Yep, it’s new! I was watching the “in progress” photos they took while building it on the Southern Living website and was excited to see how it turned out. I guess I should’ve made that more clear! Totally! If you screened it in, you’d get a lot more use out of it. I’ve seen many new homes built with the crimped metal roof. It’s attractive but I’d worry that the sun would bake on the metal and make the interior of the home harder to cool. Anyone know if this is true? Good question. My in-laws just put one on their house and they live in Florida. I’ll have to ask if they’ve had issues like that! My husband and I went and saw the home a couple weeks ago. All I can say is Bunny knocked it out of the park. The house is incredibly tastefully decorated and very livable. It wins the award for my all time favorite idea houses. It is definitely worth the drive and you could easily make a weekend of it in Charlotte. Hmmm . . . I hadn’t noticed, but Aaron’s right. The floor plan does deposit visitors right into the kitchen! That’s odd! Of course, the rest of it was just gorgeous. The kitchen’s wall of windows was just a dream, as was the outdoor sink. It would have been cool if Bunny would have surprised us a bit with something unexpected + fun. I think that one or more show-stopping/conversation-starting antiques from the area makes a house sing! Your new Blog is so lovely. Thanks for all you do for us “Hooksters” Now to this home. Like many have said, the exterior is just beautiful. It is in keeping with the Stone House vernacular in Pennsylvania which I didn’t realize would be used in the South. But, it’s lovely so who cares. Next, I’ve studied Bunny’s style and her career quite a bit and some of this house looks like her and some really doesn’t. It just doesn’t seem elegantly layered enough. Even her work with beach houses and country homes in the past is just more elegant. I’ll just bet she had her assistants do most of it. But, in any case, it’s fun to look at. Sidenote: I had the opportunity to stay in a former Southern Living Idea House turned hotel. The Inn @ Fontanel outside Nashville. It was quite an experience as the décor was outstanding. I’d call it ‘Farmhouse Restoration Hardware’ . Everything very neutral, very organic. But elegant. Our cottage had the metal roof and it was noisy even in a light rain. I’d never put on that type of roof. You might enjoy checking it – if Southern Living doesn’t have anything still up, you can just go to the website for the hotel. How fun that you got to stay in a former Southern Living house. That sounds like my kind of vacation! I’ll look for that one. Speaking of metal roofs, my in-laws just got one on their house and they did mention that it’s pretty noisy on rainy days! I was thrilled to find that the floor plan was included. I entertain myself often by sketching floor plans, and have actually done this one pretty much, minus “tavern” and plus a bedroom. 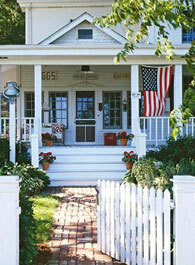 This is a beautiful house, but more important, the plan and decoration look liveable. I’m head over heels in love with this house!!! First I must say that I love your updates ! I must read it every week. I think this is one of the best SL Show homes they have ever done. I’m a Bunny Williams fan anyway so this makes my day. The kitchen layout is strange. If someone sees it in person ,can they tell us what it was like in real life? I had a laugh .You know how they say “everything that’s old is new again”? That cement sink is a copy of the one we had while growing up at the beach.It was in an old farmhouse and on our back porch ! We put the fish we caught that day,dirty shoes, anything really. This was many years ago,it was old then and I’m old now ! We ever had a haint blue ceiling on the front porch ceiling. Thank you for your fun web site and memories ! I said the exact same thing. I’ve studied Bunny’s career and the homes she’s decorated for years ( I have all her books ), from her early days @ Parish-Hadley and forward from there. She’s very self-deprecating about her earliest days @ Parish-Hadley. I love the story about the time she was to go to Babe Paley’s home in Manhattan probably just to drop off some samples – which has become one of the most iconic residences in all interior design and she didn’t have a clue the type of home she was entering. From there – to becoming one of the most esteemed designers in her own right. This house just isn’t up to her usual standards and style. I bet she has a team of assistants and I’ll bet she farmed this out to them. Just guessing. LOVE the dog trot! 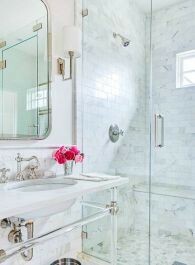 That sink is stunning, and very reminiscent of what you find in old homes. Also a HUGE fan of that paneling! It’s lovely! I’m confused as to where the casual dining room is really located according to the floor plan. Off the kitchen in the Family Hall, perhaps? If so, that would make sense. I really like the floor plan. It tells me that the “open concept” trend of recent years may be waning, and maybe people are beginning to appreciate a little room separation for a change. Good question about the dining room. I was trying to figure that out, too. It looks in Shirley’s photo like its windows overlook one of the porches. I’m guessing it’s part of the kitchen, but you’d think they would’ve marked the floor plan that way. Maybe someone who’s seen it in person can clear that up for us! And I think you’re right about the open concept trend waning. I hear from more and more people who want their rooms a bit more separate and private now. Yes, the dining area is in the kitchen. There isn’t a formal dining room in the house, but the front room (the study where the image of the dog on the sofa was taken) could probably be made into one. Thanks for clearing that up, Jeannine! i too do floorplans, probably 10,000 in my lifetime, all of my dream home. but when i gave up the dream, i gave up the floorplans. now too old to wish. but, i do love this house, just not so much the decor. i would want real farmhouse, not modern farmhouse in this house. The outside of the house is absolutely gorgeous!! Ironic that you’re featuring this house. My sister-in-law arrived today, from New Orleans, and brought a copy of this issue for me. While this place is not really my style, I appreciate quality, and this is very well done. I love the exterior. Love the whole house but especially love that kitchen. Julia, I love the new design! Great job! This house looks amazing. I actually like that the kitchen is so central in the house. This home is beautiful inside & out. Love the clapboard & stone straight away & the inside is so very relaxing & welcoming. The attention to detail throughout is what makes this a “forever home”. So many wonderful features and special touches in this house! if I lived there, the one thing I would change is the location of the master closet. I’d prefer to go through the closet to get to the bathroom rather than going through the bathroom to get to the closet. That would allow the bathroom to be more private. Just my preference. Your site is always such fun to spend time with! Thank you for the work you put into making it so. This home is beautiful! I like the feel of things collected over a lifetime. Plus it’s different than what so many blogs are featuring. I’m so tired of open concept, gray walls and white furniture! I live an hour west of Charlottesville and hope to see it soon. Love your blog Julia! 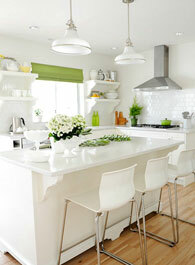 I loved the home and your website. It is so nice seeing a home NOT decorated in grey. So tired of grey. I’m over grey too! Just too much of it now. This is some spectacular home. The windows in the kitchen are magnificent and I was really taken by the dark color used in the butler pantry. The dogtrot is a great space and that soapstone sink is to die for!! 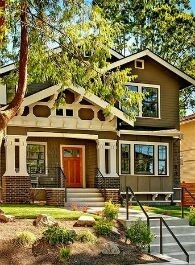 Beautiful house on the exterior..love the wood floors and they really do look old in a good way. But the interior decoration is not up to the house quality. It does look like some assistant just slapped it together…or like it was used as a design furniture warehouse for odds and end stuff….none of the art work goes together and some even looks downright terrible together on the same wall. Just one persons opinion here. I agree about the artwork. I was wondering if I was the only one who wasn’t crazy about it. Most of the house is wonderful, but some of the artwork collections seemed so disjointed and out of place, like someone was “trying” to be artsy. Other than that, the house is beautiful. Thanks for the shout out Julia….this home is certainly spectacular with the most gorgeous views. I must say that the pics do not do it justice. This home was definitely built to take full advantage of the views. I envy the new owners that will be moving in after the tour ends. Hi, Julia~ My husband and I were able to take a tour of the Idea House yesterday afternoon. It’s even prettier in person! I was amazed by all the attention to detail. I’m a Southern Living subscriber, so I knew about it and that it’s nearby (about 45 min. from us), but I’d completely forgotten until you posted, so thanks so much for the reminder 🙂 The land it’s on is gorgeous! It’s in a up-and-coming development of properties ranging from 2-47 acres of rolling hills farmland. How the other half (or the 1%?) lives! Forgot to add that the prices for the lots start at $200,000….$100,000 an acre!! But thank you for posting all the homes you do. I love seeing them, regardless.